6/12 Season Two, Episode Eight: Affair at Bromfield Hall-Scarecrow and Mrs King | "Just walk with me.."
Amanda: well, you really should be resting. Lee: Amanda I am not Jamie, I am not Philip..
Lord B to Amanda: Quick thinking! Well done!! Amanda: awh well thank you very much. Lord B thanks Amanda! Once again doing what Lee should have done! Lee learn from Lord Bromfield and repeat “Well Done Amanda or thank you Amanda” It won’t kill ya!! Great to see Amanda get some encouragement. He’s not a Lord anymore? What cheek! Off with his head! 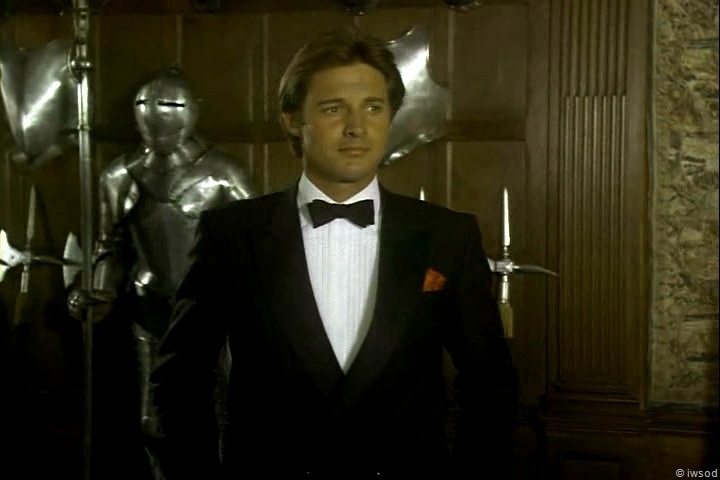 Isn’t it delicious to see Lee in a tux, standing in front of a knight’s shiny armour???? If that’s not a subliminal message I don’t know what is!!! ROFL!! we were only commenting recently (was it while walking through our man in tegernsee?) that Lee has White Knight syndrome (WKS ) when it comes to Amanda! tee hee.. It is wonderful to watch this, knowing Lee indeed does fulfil the role ( in all ways!!!) 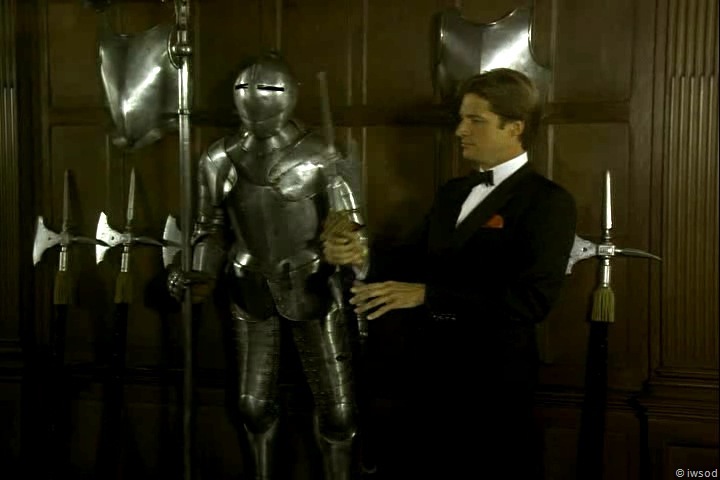 of Amanda’s Knight in Shining Armour! we just have to wait a few seasons to see it I sometimes think Lee uses his tuxedo like it’s an armour..
.. I’d keep them away from Phillip and Jamie. …but I daresay they did their share of damage in their own time. [ What a coincidence! Just like Lee’s Tuxedo!! 😉 ] I am sooo distracted by the strictly decorative Tux.. this episode? err it is now one of my favourites! 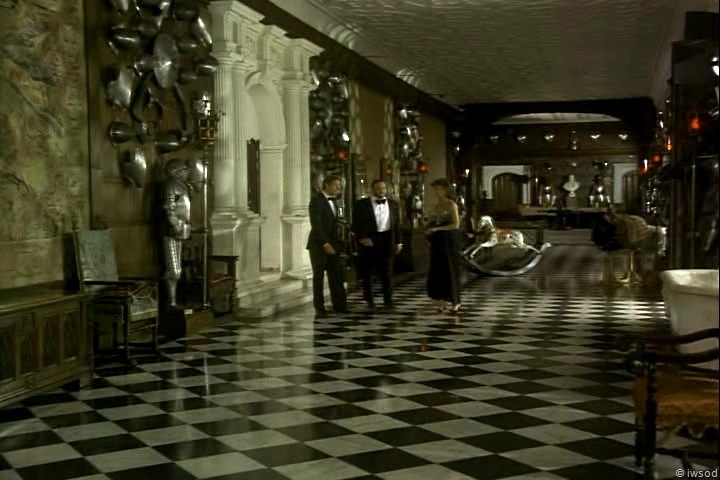 Lord B: you know, it’s a great shame… that you didn’t actually see that photographer in the act. (Amanda nods, she’s so diplomatic!) If you had done, we could have brought charges against him. Amanda: Why are you so sure that it was the photographer? Lord B: well who else could it be? I checked him out…. Lee: Yes, yes . I still think it’s a little out of character. Lord B: You care to elaborate on that? 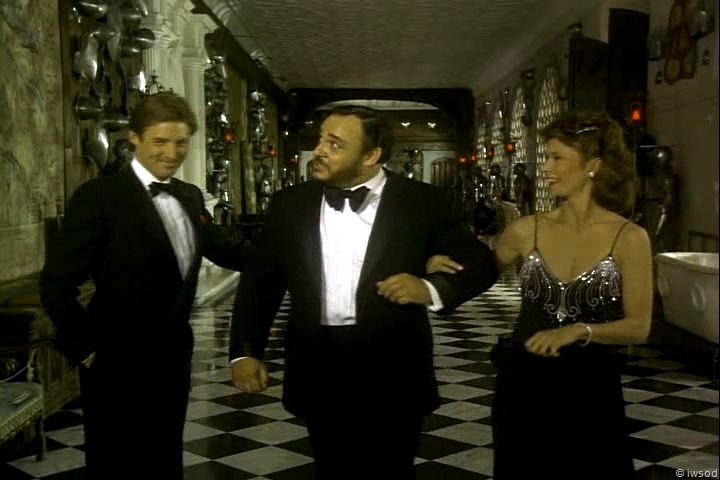 Lord B: are you quite sure you want to go to this retched party Mr Stetson? Lord B looks away and starts doubting whether he should go.. Lee quickly gives Amanda that look again – LOL she is starting to get use to them!! and she sees Lee wants her to back him up in his enthusiasm for going to the party! tee heee… Amanda is learning Lee well! It’s very cute watching the penny drop with Amanda! Amanda: Ohh I’m looking forward to it too! Lord B: Oh are you? 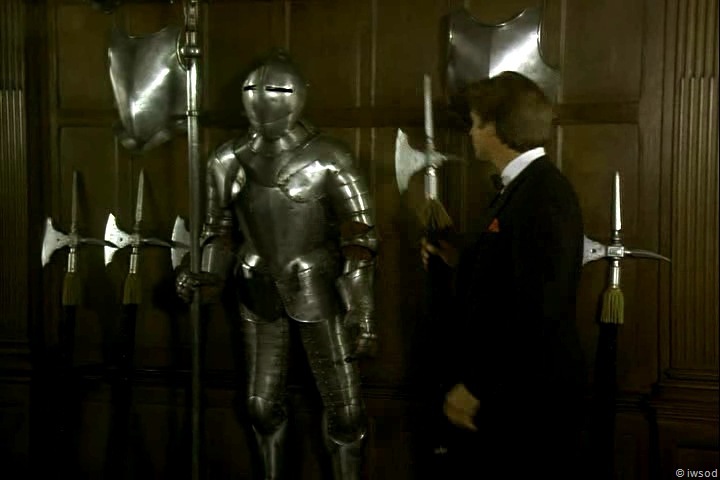 Lord B: ohh well, then in that case, we shall spend no more time in this dusty armoury. Lee read Lord B well, he knew he was a gentleman, and if Amanda wanted to go to the party – then they would be going to the party! Go Lee! Now if only he could learn Amanda!! he is trying..but being so unique..it will take a few more seasons I think Ha!! Well, with all this tuxedo goodness on display.. I really must pace myself! I shall finish up there for now.. 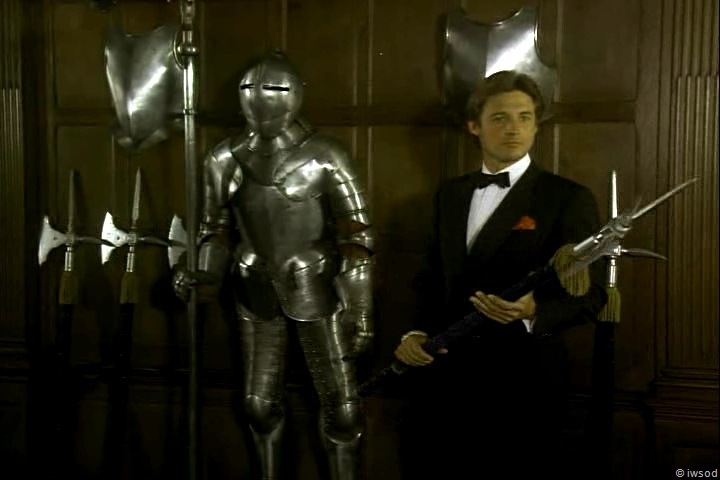 I would love to hear your thoughts or experiences of this tuxedo err I mean episode.. Thanks for reading! back with more soon..
There’s just something about a man in a tux……even a not so gorgeous man looks good in a tux…..but….when you are a Greek god and then put on a tux…..zowie….wowie….my heart is doing a somersault…..my breathing is laboured….I’m a mess! How does KJ do it? 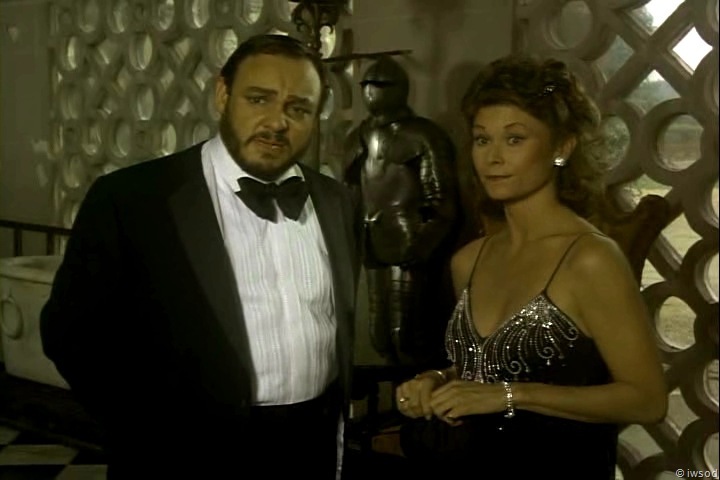 I couldn’t be around BB in a tux and utter a single line coherently. My explanation for Amanda calling Lee “Mr. Stetson” and his remarks about her feeling responsible: Yes, they are supposed to be pretending to be more than employer-employee, per LB’s suggestion, BUT remember that LB thinks they really ARE just work associates. So in his presence, Lee and Amanda need to maintain that cover story. But Amanda can’t help showing how she cares for Lee – the fussing over his shoulder – so he has to produce a rationale for her concern that kind of works in the context of an employer/employee relationship. 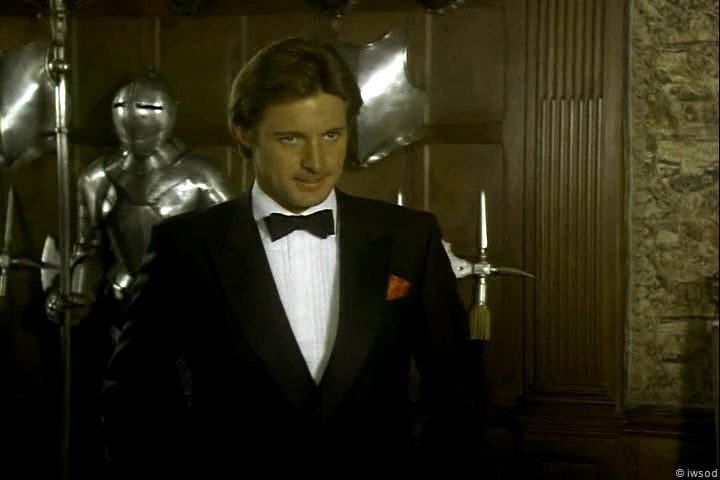 And yes, Lee looks tasty in a tux. Lee is reading an awful lot into Compson but I can see his logic. Here is a man who makes a living taking seedy photographs. Kill the target and your job is kinda of redundant. IWSOD, can we save these photos so we can use them as wallpaper or screen savers on our computer? Great to hear from you all! sounds like Thanksgiving has been a busy time for you all! I am glad you stopped by before we got to the next post – the big ‘ Touching down by the Thames’ scene 😉 I REALLY want to hear your thoughts!!! 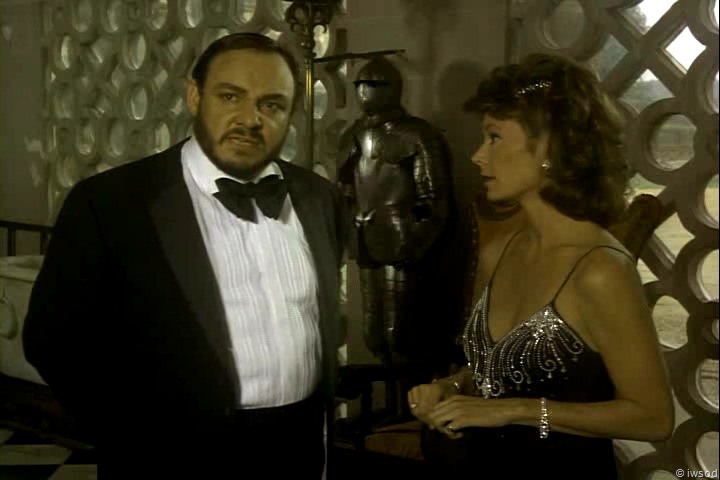 I do like Amanda’s dress here. It’s so lovely on her. 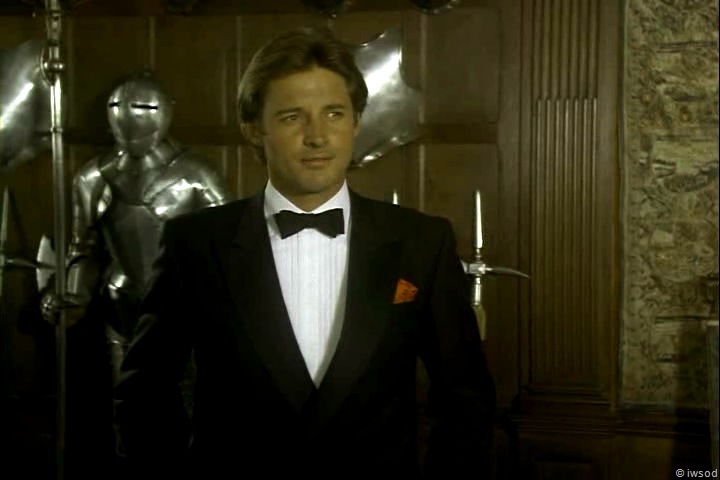 Lee in the tux – handsome as usual. 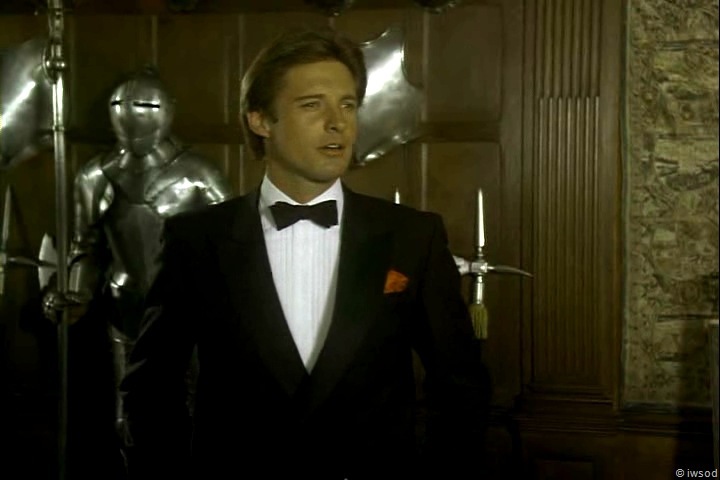 Lord Bromfield is playing the long-suffering husband, I think. He’s not one to be social, but his wife is, so he goes along. He’d much rather sit and chat with Lee and Amanda in a library or something – which is why he’s blind to his wife’s shenanigans. And, it is also why he was so easily brought into this scandal. Could this be a warning about Neglecting those close to us?? ahem????!! Also, the whole ‘ridiculous’ scandal is very dismissive of Amanda’s passionate side..[she is not just ‘practical’ ] soooo I wonder if they are hinting here.. hmm just pondering that one.. if you have any thoughts on this or ideas – please share! Input is fab! byeee for now! Okay, I rewatched this epi last night and I gotta say I am rather disappointed that Lee is so condescending to Amanda. It’s always bugged me in this ep but moreso now for some reason. H doesn’t seem to trust her instincts in this ep like he had in previous ones. He is forgiven with the tux butI gotta say I love the hair! Or my keyboard woes could be caused by it shorting out because of me drooling on it. Tux! Tux! Tux! Tux!